Successful team members don’t do the same thing at the same time. They do the right thing at the right time. And while team members work together toward a common goal, individuals still must play their separate parts in the process. As organizations rely more and more on teams to innovate, problem-solve, produce, and compete at the speed of change, understanding and capitalizing on individual approaches to group process is the bottom line on creating high performance teams. Creator: Generates fresh ideas and original concepts. Goes beyond the obvious and sees the “big picture.” Adds spontaneity, excitement, and energy to the brainstorming process. Recognizes alternatives. Is willing to solve problems. Advancer: Recognizes new ideas in the early stages and develops ways to promote and move ideas toward implementation. Uses insightful planning and past experience to guide success. Energetically supports team objectives. Uses the most efficient method to achieve objectivies. Refiner: Challenges concepts and ideas, often playing “devil’s advocate.” Methodically analyzes ideas to uncover potential problems and suggest solutions. Is detail-oriented and analytical. Acts as a practical sounding board for new ideas. Executor: Lays the groundwork for implementation, paying attention to details and striving for quality outcomes. Is willing to execute ideas. Follows directions thoroughly to complete tasks and projects. Identifies flaws early in the process. Facilitator: Monitors the contributions of all team members and makes sure tasks are handed off at the right time in the process. Negotiates with all types of people. Identifies what is missing in the process and keeps things moving. Offers suggestions on how to improve the process. The Team Dimensions Profile uses the “Z Process” to map the flow of assigning roles, completing tasks, and handing off tasks to other team members. In this relay process, tasks are passed from Creators to Advancers, from Advancers to Refiners, and from Refiners to Executors. Facilitators make sure the handoffs are made at the right time. The Team Dimensions Profile and its unique Z Process help you begin at the beginning and end with success in meeting the team challenge. It’s a proven way to clarify roles, simplify processes, and maximize individual contributions for total team results. 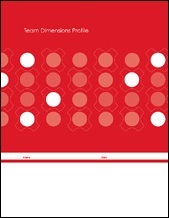 The Team Dimensions Profile Facilitator’s Kit provides everything trainers need to administer the Team Dimensions Profile in facilitated sessions. The kit includes research and technical background, a fully scripted seminar, presentation materials on CD-ROM, and two profiles.